Aroon Fona is an advocacy writer. In his weekend commentary on Rescue Line Sierra Leone, founded by Sulaymasis Yankay Sankoh, Fona shared his perspective on malaria and looked back to an eminent Sierra Leonean medical doctor and herbalist for some lessons learned. "25th April is World Malaria Day," Fona observes. However, in Sierra Leone, it's really "funeral day" for those who've lost [or] are losing their lives to a disease he says is "preventable and curable." Fona also thinks that had Sierra Leone built on the efforts of trailblazing Dr. Cole and the west African nation encouraged its long pipeline of students and medical personnel to continue Cole's research, the number of lives lost to malaria would have been zero by now. "The disease can be eradicated, is preventable and completely curable. 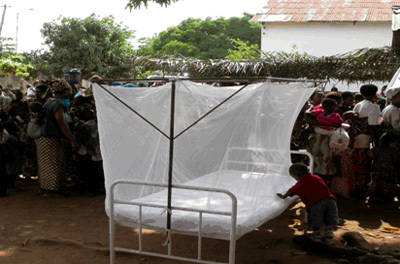 It is cost effective to eradicate and prevent malaria, we have been paying the ultimate price for the longest," he said. The medic Fona invokes is the almost forgotten John Augustus Abayomi Cole, born in Nigeria in 1848. Cole became famous for his combined training of western science and in the healing properties of traditional herbs, roots and leaves. In 2007, a whopping 40 percent of deaths in Sierra Leone were due to malaria-related causes, he said. "Almost all Sierra Leone[an] families have faced malaria fever,” Fona adds. The disease has taken a heavy toll on thousands if not millions of lives and devastated many families over the years. The number of children under age 5 dying every day drops steadily every year, UNICEF says. Four years ago, more than 25,000 children died daily of preventable causes and treatable diseases. Today, that number is 19,000. UNICEF and its partners have played a huge role in reducing the global under-5 mortality rate. The target is zero children dying of causes that can be prevented. 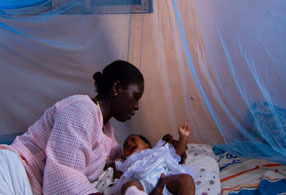 On World Malaria Day 2012, the World Bank said that although as many as one in two children under the age of five admitted into children’s wards in Sierra Leone have been there as a result of severe malaria, Sierra Leone has been fighting back against this preventable and treatable disease that both affects individual families and costs Africa billions of dollars every year. "As of June 2011, according to a Malaria Indicator Survey, 87 percent of all households in Sierra Leone now own at least one mosquito net that has been treated with insecticide. This is a huge increase from the previous year, when just 33 percent of households owned one." To support the mosquito net campaign in Sierra Leone, the World Bank said it provided over US$ 6.6 million that covered the purchase, shipping, and delivery of over 1.1 million nets—more than a third of those distributed during the campaign. Professor Osman Sankoh is another Sierra Leonean at the front line of global efforts to improve health information for better health policy. 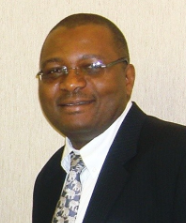 Dr. Sankoh is the executive director of the International Network for the Demographic Evaluation of Populations and Their Health (INDEPTH Network). INDEPTH is a network of 40 health and demographic surveillance system field sites run by health research centers that evaluate populations and their health in 20 low- and middle-income countries in Africa, Asia and Oceania. Sewa News: As you know, malaria is one of the biggest killers in Africa. Tell us about some of your organization's activities planned for April 25; when people across the globe will take part in a range of activities to mark World Malaria Day. Osman Sankoh: Our member research centers are spread across Africa, Asia and Oceania. They will organize center-specific activities to mark World Malaria Day 2013. Since we are researchers, many of these centers will present to their stakeholders, especially the Ministries of Health, recent results from various malaria studies they have conducted. At the secretariat/headquarters level in Accra, we will publish a statement on INDEPTH’s position and make a call on governments and funders to continue to fund research in malaria. We will also support the African Media and Malaria Research Network, a group of journalists who write on malaria issues, in their activities which usually include a symposium. Sewa News: We have focused above on malaria because of the forthcoming World Malaria Day, but which other key activities is the INDEPTH Network involved in? Osman Sankoh: Let me list a few activities in which several of our member research centers conduct cross-center, cross-national and even cross-continental studies. Studies that examine the non-specific effects on child survival of specific vaccines; a project to develop sustainable capacity for research for health and its social determinants; studies of the epidemiology of epilepsy; studies to understand the impact of universal health coverage on the poor and vulnerable; a project to enhance research data management capacity for analysis, publication and sharing; and a project for the genomic study of body composition and cardio metabolic disease risk in Africans. On capacity-strengthening and training, we provide Master of Science degree and Ph.D. scholarships to deserving Network scientists and organize a series of training workshops in relevant areas of research. Sewa News: What do all these studies and projects mean for populations and their health in the 20 countries you work in? Osman Sankoh: A very good question indeed. Research is important for meeting health needs and improving health outcomes. This may seem farfetched especially in low-income countries where there is a more compelling need to provide service NOW to the poor and vulnerable populations than spend limited funds to conduct research over a year or two. It is perhaps the chicken-and-egg issue― which comes first? I am of the opinion that our countries should not see research as an expense today that has no bearing to the future; rather, they should consider investing resources in developing and strengthening their health research systems for a better and healthier future. So our studies and projects contribute in diagnosing health problems and in deciding on interventions that are appropriate and feasible. We communicate with communities and inform of new insights from our research. Sewa News: When we last spoke about the work of Indepth in 2006, Prof. Binka was executive director. On April 25 that year, Indepth announced the establishment of the Malaria Clinical Trials Alliance (MCTA). The organization had just been bolstered by a $17 million grant from the Bill & Melinda Gates Foundation to conduct clinical trials of new drugs and vaccines to fight malaria, provide assistance to research centers in Mozambique, Tanzania, Malawi, Gabon, Nigeria, Ghana, Gambia, Kenya and Senegal and help strengthen research and development activities targeting malaria. Have you developed a vaccine? Osman Sankoh: This is a very difficult question. Let me explain a bit. Any good textbook will tell you that there are two broad stages for the development of vaccines―preclinical and clinical development stages. During the preclinical development stage, research is carried out in lab assays and on animals and it usually includes identification (discovery) of relevant antigens, creation of the vaccine concept, evaluation of vaccine efficacy in test tubes and animals, and the manufacture of the vaccine to what we refer to as Good Manufacturing Practice (GMP) standards. Then we have the clinical development stage in which the vaccine is first tested in humans. That’s a big difference! Because it is humans, scientists must be extremely careful and stringent ethical principles of informed consent from volunteers must be put in place. This stage deals with the safety and efficacy of the vaccine. Testing a vaccine in humans involves four phases over a long period. Phase II clinical trials consider more humans in the trials and assess how efficacious the vaccine is against infection and clinical disease. Phase III clinical trials are large-scale involving many hundreds of people across several trial sites with the purpose. This is a period of many anxious moments for the manufacturer of the vaccine because if it is shown to retain safety and efficacy over natural disease conditions, the manufacturer can apply for a license to market the product for human use. There are regulatory authorities in the US and Europe, for instance, who have competence in reviewing the applications and issue licenses. Phase IV clinical trials are post-marketing surveillance, after a vaccine or drug has been licensed, to evaluate and detect any rare adverse effects and assess the efficacy of the product over a long-term. We were funded by the Gates Foundation to partner with others to conduct Phase III trials of the RTS,S vaccine which was a promising vaccine against malaria. As you have stated, several of our member centers took part in these trials across Africa. Unfortunately, the results published in late 2012 showed that the product did not achieve the ‘pass mark’ for it to be registered yet. Sewa News: How has MCTA made sure that there is an African contribution and development of African expertise to the development of new tools and interventions? Osman Sankoh: The trials brought the INDEPTH Network, African scientists and African institutions to the limelight of vaccine development. INDEPTH funded the centers/sites to conduct the trials to Good Clinical Practice (GCP) standards and since then the network is highly respected for its quality science in this and other areas of research. If you visited several of our trial centers that took part in these cutting-edge research, more than 80 percent of their staff are Africans, largely nationals of the countries. Unfortunately and it is very sad to say that when you read the reports in influential newspapers in the north on the results of the RTS,S vaccine trials, there was little or no mention of our trial sites in Africa by name. I am proud to note that some of these centers, Kintampo Health Research Center in Ghana and the Ifakaka Health Institute in Tanzania, won the prestigious “Prince of Asturias Award” in 2011 for their contribution to malaria research. Sewa News:Would you say Network sites are centers of excellence in training next-generation African research scientists? Osman Sankoh: Yes, I would say exactly that. In fact, after the MCTA grant, I signed, in 2009, a new $28.6M grant to enable the Indepth Network to conduct safety and effectiveness studies of antimalarial in Africa. We have created an exciting platform that aims to enable African researchers to carry out large Phase IV trials I introduced above. This will result in systematic, evidence-based reviews of the comparative effectiveness and safety of malaria drugs in many widely used drug classes, and to apply the findings to inform public policy and related activities in local settings. This kind of Phase IV studies for antimalarial has not previously taken place in Africa under the direction of African researchers. It will provide objective country-specific effectiveness and safety data to inform global and national policy and practice and will speed up access to evidence on treatment effectiveness and safety. The INDEPTH Effectiveness and Safety Studies of Antimalarial in Africa (INESS), as we call the platform, will also enhance African capacity to monitor local health systems in order to the track the costs, effectiveness of coverage, and impact of newly registered antimalarial treatments. Overall, INESS aims to reduce the time gap between the licensing of a new drug and its introduction into health systems for use.